Interventional Radiology, at Duke University Medical Center has been performing Uterine Fibroid Embolization since 1999. Having treated more than 500 women with fibroid related symptoms; we are devoted to providing safe, effective, and individualized care. Our three goals are to educate women on the treatment options available, perform a safe and effective Uterine Fibroid Embolization when indicated, and provide excellent care for women following their procedure. A fibroid is a benign (non-cancerous) tumor of the uterus smooth muscle; also known as a leiomyoma or myoma. There can be a single or multiple fibroids within a woman’s uterus. They are the most common tumor of the female genital tract occurring in 50% of women. Although roughly 30% of women with fibroids will have symptoms, African American women are more likely to be affected. Symptoms typically affect women in their 30’s and 40’s. Fibroids are the leading indication for the 600,000 hysterectomies performed in the United States each year. A minimally invasive alternative to surgery for patients with symptomatic uterine fibroids. In August 2009, the American Journal of Obstetrics & Gynecology stated, “UFE is a safe, effective, and durable nonsurgical alternative to hysterectomy.” The procedure involves injecting particles into the arteries that supply the uterus. The particles block the blood flow to the fibroid which results in their destruction and shrinkage. This procedure is performed under sedation and requires overnight observation. Menstrual-like cramps are typical the first few days following UFE, so women are sent home with pain medication to maintain comfort. Most women return to normal activity within a week. It is necessary to have a recent pelvic examination and a normal pap smear by a gynecologist or primary care provider. For women with abnormal uterine bleeding or a thickened endometrial stripe on imagine, an endometrial biopsy should be done to rule out endometrial carcinoma or hyperplasia. An MRI of the pelvis is obtained prior to visiting the Interventional Radiology (IR) physician. The MRI helps to determine whether or not a person is a candidate for UFE. During the visit with the IR physician, a thorough history and physical will be completed, the MRI imaging will be reviewed, and the procedural details will be discussed. On the day of the procedure, an IV will be placed to administer sedation and any other medications. Once in the procedure room, an Interventional Radiology Technologist will scrub and drape the right groin area. Sedation will be given. The physician will then place a catheter into a femoral artery. This catheter will be directed into the arteries that supply blood to the uterus and ultimately the fibroids. 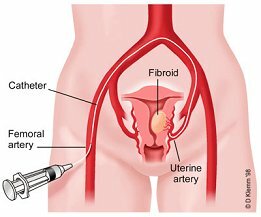 When a safe catheter position is established, particles are injected to stop the flow of the blood to the fibroids. Once both uterine arteries are treated, the catheter is removed. This procedure usually takes less than 2 hours to perform. After the procedure is over, it is necessary to spend time in the recovery room before going to a private room for overnight observation. The most common complaints following UFE are menstrual-like cramps and nausea. To help keep the pain under control, a PCA (patient controlled anesthesia) pump is used to administer pain medication as needed. In addition to the pain medication, anti-inflammatory and anti-nausea medications are given. Over 90% of women are able to go home the day after the procedure. After discharge, it is possible to experience continued cramping over several days. Pain medications can be prescribed to control these symptoms. The cramping typically lasts the same duration as a menstrual cycle with resolution within 7-10 days. An evaluation will be scheduled with the IR physician two to three weeks following the procedure. The earliest benefit is the brief time required for recovery following UFE. Patients typically are back to work and play within 7 to 10 days. For bleeding, our results and published reports confirm that greater than 90% of women will experience a decrease to a normal cycle. There is an 85% chance that the pain or bulk symptoms such as urinary frequency will improve. Greater than 80% of women will have a durable and effective resolution of their symptoms following UFE. About 2% of women completely stop having menstrual periods after uterine fibroid embolization. It remains unclear whether this is a result of decreased ovarian function from the procedure. Adverse reactions are anticipated in less than 3% of women. Serious potential complications include injury to the uterus from decreased blood supply or infection. This is rare and hysterectomy (surgical removal of the uterus) to treat either of these complications occurs in less than 1% of women. Long-term complications are uncommon, though several questions about potential side effects remain unanswered. It is uncertain what effect blocking the uterine arteries will have on the ability to become pregnant in the future, or to carry a pregnancy to full-term. The majority of women that have had this procedure are finished with childbearing, therefore only a few women have tried to become pregnant after this procedure. 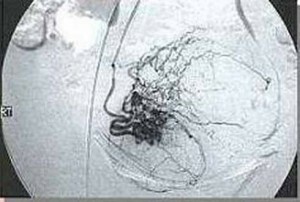 Embolization is a technique where a catheter is passed through the artery supplying a region and a material is injected which blocks blood flow. The catheter is placed from the artery in the groin and advanced to the area of interest. Embolization therapy has been used for many years for the control of bleeding caused by trauma and the treatment of other tumors within the body. This technique has been used for close to 40 years. The procedure was first used in Europe to decrease blood loss that can occur during myomectomy. Many women found that after the embolization procedure their symptoms improved, the remaining fibroids shrunk in size, and surgery was no longer necessary. This prompted physicians to use this as a standalone therapy. How long does UFE take? The procedure takes about an hour to complete. The total time within the room can be as much as 2 hours depending upon your anatomy and the time required for sedation. Will I feel the catheter going through my arteries? You may have sensation in the groin where the artery is accessed. To treat this, a combination of sedation and local anesthetic is used. There is no sensation within the arteries as the catheter travels through them. A sense of warmth may be felt when contrast is injected into the artery. Otherwise, there should be no awareness of the catheter or the embolization itself. Should I expect pain following UFE? Women typically complain of severe menstrual-like cramps following the procedure. This is the reason we have chosen to keep women in the hospital the first night. The day after the procedure, the pain is usually improved and much more responsive to oral medications. Pain medication is usually needed for the first 3 to 7 days following the procedure and may be stopped sooner if the patient feels she no longer needs them. Is it necessary to stay in the hospital after the procedure? We have been performing UFE since 1999 and have found that patients are better taken care of if they stay overnight in the hospital. The main concerns following the procedure are pain and nausea. These are best handled with intravenous medication. This results in most women tolerating conversion to oral medications for adequate pain control. UFE has been studied broadly by radiologists and gynecologists over the past 15 years. It resolves pain and bleeding 80 to 90% of the time. Fibroids will typically shrink 20 to 50% in the first 3 months and between 40 and 70% within a year. How does UFE compare to surgery? Multiple studies have shown UFE to be safer than the surgical alternatives. The risk of complication related to surgery is between 17% and 23% compared with 5% for UFE. The recurrence risk of fibroids with myomectomy is 23-51% over 5 years compared with 8% in women treated with UFE. Fibroids may arise in different parts of the uterus (see graphic) and are named according to their position within the layers of the uterus. The position of the fibroid determines the type of symptom you may experience and the treatment options available. The growth rate of a fibroid is dependent on hormones (estrogen, progesterone and possibly others). Growth rates vary greatly among women and the cause for this variability is not known. Below the graphic is a list of the different types of fibroids and the symptoms that are typically associated with them. Submucosal: This fibroid grows below the surface of the uterine cavity. It is associated with bleeding and pain. Intracavitary: This fibroid grows into the cavity of the uterus on a stalk much like a mushroom. It is associated with bleeding and pain. Intramural: This fibroid grows within the wall of the uterus and can cause pain and bleeding. If they grow large enough they can cause urinary frequency and bloating. 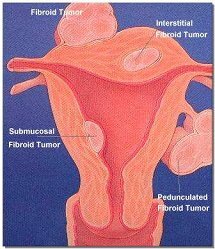 Subserosal: This fibroid grows below the outer surface of the uterus. It is associated with pain and cramping and can cause urinary frequency, bloating and the sense of being pregnant. Pedunculated: This fibroid grows off the outer surface of the uterus on a stalk much like a mushroom. It is associated with pain and cramping and can cause urinary frequency, bloating and the sense of being pregnant if they become large enough. Adenomyosis: This is the ingrowth of endometrial lining into the wall of the uterus. It can imitate the symptoms caused by fibroids. It is responsive to embolization and will be discussed in a separate section. Bleeding is the most common symptom associated with fibroids. It typically presents as heavy menstrual bleeding, often with passage of clots. As a woman progresses toward menopause, bleeding can become unpredictable or continuous. Anemia, which may be severe, is a common side effect. It is not known how fibroids cause heavy cycles, but they are believed to alter the ability of the uterus to control the degree of bleeding during a menstrual period. Pain is another common symptom which may present as cramping or pressure. Fibroids can also press on the nerves that supply the pelvis and legs causing pain, which may mimic back problems. Women often experience severe menstrual cramps with the growth of their fibroids. Frequent urination is due to the pelvis having limited space available for the female genital tract and bladder. As Fibroids grow, they compete for space within the pelvis. This decreases the ability for the bladder to expand resulting in feeling the need to urinate. This can occur during the day or night. Many times women with these issues will change their lifestyle including limiting their intake of fluids to prevent having to urinate frequently. Bloating is probably the result of the enlarged uterus in combination with the increased blood flow associated with the growing fibroids. As the fibroids increase in size they can compress vascular structures causing heaviness within the pelvis which will progress during the day and will typically worsen during menstruation. Other suspected symptoms include infertility and/or repeated miscarriage. However, the statistical evidence for infertility is lacking and other factors are more likely to cause infertility in patients with fibroids. Some researchers have suggested that the presence of fibroids may predispose a patient to miscarriage, but reliable evidence to support this possibility is not yet available. Fibroids are typically discovered by using symptom history in combination with pelvic examination. It is important to have regularly scheduled pelvic examinations and PAP smear performed by a primary health care provider (Family Physician, Gynecologist, Nurse Practitioner or Physician Assistant). Ultrasound is often used for evaluating the presence of fibroids and ovarian problems. Magnetic Resonance Imaging (MRI) is another imaging tool used to better define the size, extent and distribution of fibroids. MRI allows for more precise treatment planning for alternative therapies or minimally invasive surgical procedures. Once fibroids are confirmed to be the cause of symptoms, a physician can discuss the potential treatments that are available today. When should Fibroids be treated? This is dependent upon the individual. The main reason to treat fibroids is to improve a woman’s quality of life. Fibroid related bleeding can cause women to miss work, or compromise their social life and travel plans. Some bleeding can be severe enough to cause anemia or require blood transfusion. In this situation, the treatment is more required than optional. Urinary frequency can impact sleep patterns and also make a long trip in the car difficult. The pain and pressure related to fibroids can even require narcotic medication to make the woman able to tolerate her symptoms. Medical: Since the majority of fibroids do not cause symptoms, there is a possibility the fibroids may not need to be treated. Once symptoms develop, medical management should be the initial therapy. This includes treatment with non-steroidal anti-inflammatory agents, oral contraceptives, progesterone analogs or gonadotropin releasing hormone agonists (Lupron). The decision for further medical management depends on the patient’s age, the size of the fibroids, the desire for future pregnancy, and the severity of symptoms. Surgical: For women who do not respond to medical therapy, hysterectomy has traditionally been offered for their treatment. 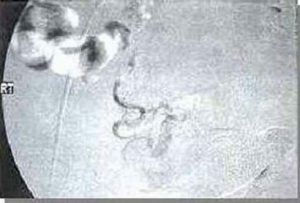 Other surgical options include hysteroscopy (a procedure in which a fiber-optic scope is advanced into the uterus allowing the physician to remove endometrial polyps or submucosal fibroids), endometrial ablation (removing the lining of the uterus in order to control bleeding), and myomectomy (removal of the fibroids off of the uterus). Detailed discussion of the surgical options can be obtained by a consult with your gynecologist. Additional Treatment Options: Uterine Fibroid Embolization (UFE) and MRI guided focused ultrasound are treatment alternatives for symptomatic fibroids. Uterine Fibroid Embolization has been used since 1999 and has been studied thoroughly. Uterine Fibroid Embolization (UFE) is an effective treatment alternative for women with symptomatic fibroids.